As you might know, we worship three deities in our temple, Jagannatha (Krishna), and his siblings Baladeva and Subhadra. 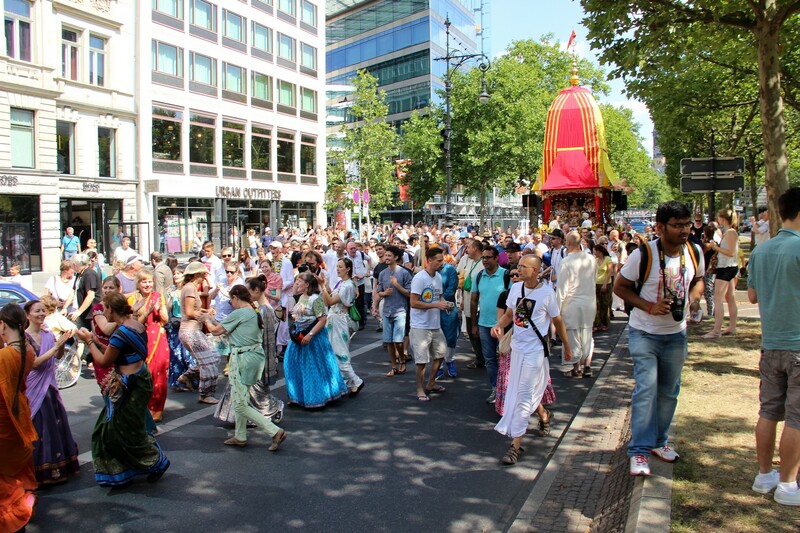 Usually, Jagannatha, Baladeva, and Subhadra remain inside the temple and receive visitors from the Berlin congregation, and other guests, but once a year, they leave their temple and ride on a chariot through the streets of Berlin to visit all Berliners and bless them personally. 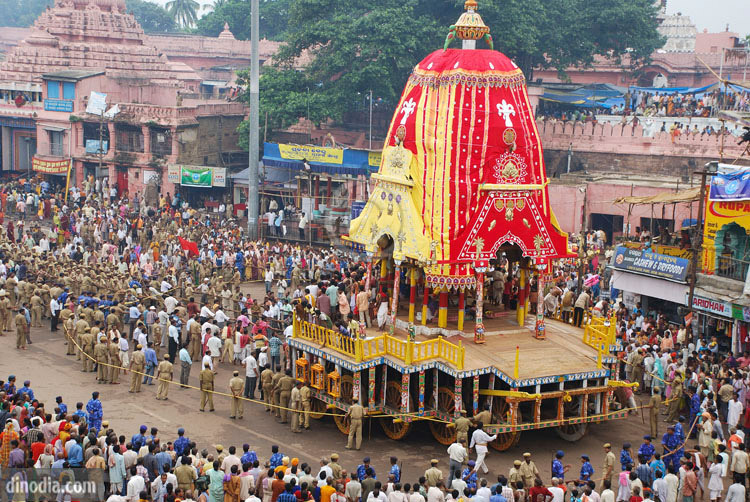 This event – going back to the ancient festival in Jagannatha Puri, India – is called “Ratha Yatra” (Festival of the chariots). For our congregation in Berlin, this festival, which we also consider a demonstration for peace, is the highlight of the year. This festival has existed for millennia in India, and since 1967, through the efforts of Shrila Prabhupada, it has been celebrated worldwide. After diligent preparation, the festivals starts at a summer day at noon in front of the Brandenburg Gate. There you will see how guests of honour hold coconuts in front of the chariot that are smashed on the ground to remove all obstacles and thus create an auspicious atmosphere. Then, many of those present take the ropes attached to the chariot, and proceed to pull the chariot eastwards along the street “Unter den Linden”. Slowly, the procession sets in motion. In the very front (and in the back), the police take care that the road is clear. 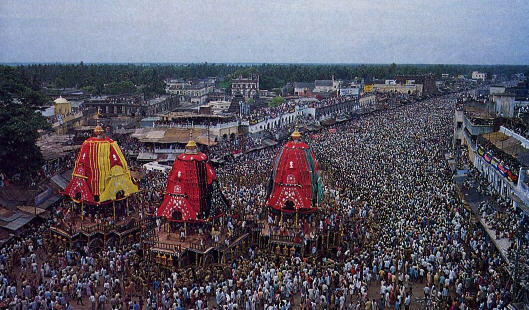 They are followed by the first participants of the procession, one of whom is holding a broom to sweep the streets enthusiastically for Jagannatha. Another four people carry our deities of Shri Chaitanya and Shri Nityananda on a small wooden palanquin. Behind them, are two rows of female dancers, whirling along the street, dressed in their best attire, and their faces often decorated with floral patterns. At each rope, 30 to 40 participants pull the chariot, singing happily. Between the two ropes, further participants dance and sing – among them the musical core of the procession: the singer leading the chants, the harmonium player and the people playing the mridanga drums and cymbals. On top of the colourful chariot, Jagannatha, Baladeva, and Subhadra, opulently decorated with flowers, are gleaming in a way they never do during the rest of the year. Accompanied by two priests sitting next to them on the chariot, they are worshipped with flowers, incense, fans, lamps, as well as sweets and fruits, which are later on distributed among the participants and bystanders. 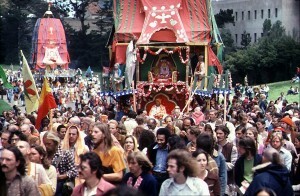 Around the scene, photographers capture the mood of the colourful procession. Most pedestrians remain on the pavement to look at the procession; many take out their phones to take pictures or shoot videos. Others also use a selfie stick and take a picture of themselves with the procession behind them. As colourful as the procession is, as colourful are the streets of Berlin – here you encounter people of all kinds with a wide array of different worldviews and faiths. Only rarely will you find someone who is not enthused by the happy, colourful, and singing crowd of smiling and dancing people. 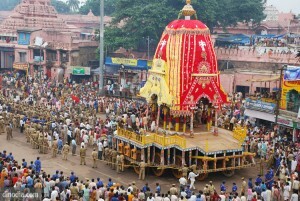 At some spots, traffic light posts or trees are so low that the canopy of the chariot is lowered so the procession can proceed. The new, more sophisticated equipment of the chariot makes this a simple process. After around one hour, the direction of the procession turns, leading along “Unter den Linden” back towards the Brandenburg Gate. At the Brandenburg Gate, as every year, there will be a stage programme with dance, music and many other things. Next to the stage, a vegetarian feast is distributed to the hungry participants, while at the side, people can enjoy a variation of books, sweets and lassi, or even henna painting. The Ratha Yatra is a festival of happiness, spirituality, and peace. It definitely belongs to your list of 100 things you should have seen at least once in your life! Check our Youtube channel and Facebook page for more pictures and videos!